Why can you convince your parents so easily? Because you know them. You know what they want, who they are and what they value. If you could know your customers as good as your parents, you could create astonishing advertising. Hard data first: The first step is to learn about the market in general. Read statistics about the person’s sociodemographic, read trade publications and websites about the market. This should help you to get a big picture about the market and its needs. Understand your customer: The next step is to actually understand them. A good way is to live like one and talk to others in the same segment. You want to really understand them, i.e. you don’t ask “do you prefer product X over Y?”. You should ask what their goals in life are, whether they prefer freedom over security and what they would do if they don’t have to work. You want insights not just facts. Connect your customers and your brand: To hit the sweet spot you have to connect your brand/product with the customer insight. A nice example is Harley-Davidson. The customers want freedom, they want to be different and non-boring. Harley-Davidson offers exactly this. They embody these values and that leads to astonishing loyalty among their buyers. 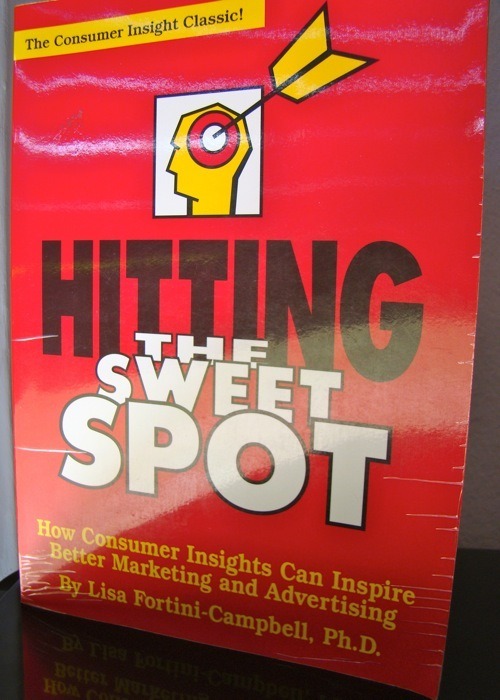 Hitting The Sweet Spot by Lisa Fortini-Campbell is pretty nice. It’s short, concise and full of examples. About the last 100 pages are examples of people using the methods described in this book. I can only recommend reading this book because you are deepening your understanding of successful marketing campaigns. Recommendation.